It is difficult to imagine now wearing sunglasses during the summer. The sun is a bit difficult to bear when there is little shade available. For us, sunglasses are mandatory but what about our pets. Dogs can suffer just like we do when it comes to sunlight especially during the summer but there is a solution. While some might not be aware, there are sunglasses that are actually designed for dogs. Dog sunglasses help in several ways. First of all, they protect their eyes from harmful UVA and UVB rays. Second of all, they protect their eyes from dust and wind. None of them offer a complete sealing effect meaning that they do not work all that well under water but when it comes sunlight, dust, and wind, they offer decent protection. We picked 10 dog sunglasses that have a functional design and do not cost all that much. 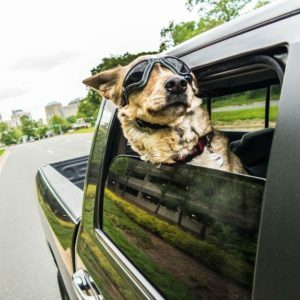 Here is our selection for the top 10 best dog sunglasses. WESTLINK dog sunglasses are a great pick for dog owners that are looking to keep their pets safe during the summer. They have a very simple design that makes them stay on properly and high-quality lens. Despite the low price tag, the glasses come with the lens that offers UV protection and have an anti-fog coating. They are also quite resilient and will not shatter. The lens can be found in several different colors. As for the frame and design, the glasses are made like googles. They have a small adjustable elastic strap that keeps them in place and the frame is made from a flexible material that does not break. The googles are available in 3 different sizes. Doggles ILS Silver Skull dog sunglasses are a popular model mainly because of its stylish design. Even if they look like goggles, they fit quite well and will not fall off. They have a skull printed on the sides but can be found with other designs. The sunglasses are available in 3 frame sizes to fit dog breeds of all sizes. They are made from a durable plastic material that does not break and have rubber elements to make them more comfortable. To keep them on properly, the sunglasses have been fitted with an elastic strap. Their lens offers UV protection and is anti-fog. The lenses also do not scratch easily and were made to be shatterproof. Top-Elecmart dog sunglasses are not only inexpensive but quite functional and well made. The sunglasses are designed like goggles meaning that it has a head strap made from an elastic material to keep them properly in place. The model is made with a frame from a flexible material so that it will not break. It covers the eyes of the dog on the sides to help protect against wind, dust, and debris. Also, they have foam cushioning to make them more comfortable to wear. For the lens, a UV protection coating has been applied. They are made from a durable material that does not get scratched easily. Also, they have an anti-fog coating and they are fairly clear when compared with another lens. Namsan dog goggles can be considered the fanciest model we were able to find. Their lens is a bit larger and they look as if they do not have a frame at all when looked at from the front. They do have a frame but it is hidden. The model was built with cushioning on the inside to make them more comfortable to wear. They do not keep water out but they help protect the dog from dust and debris as well as wind. The frame itself is quite durable and does not break easily. As far as the lens goes, the model offers 100% UVA and UVB protection. They are shatterproof and are quite difficult to scratch. The goggles are available in several different lens colors and frame shapes. 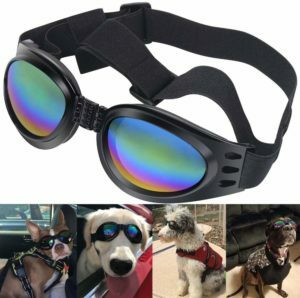 Petleso dog sunglasses are a great pick for dog owners that do not want to spend a ton of money on a pair of goggles for their furry companion. It is not that expensive and quite decent when it comes to building quality. The model has a durable plastic frame that is a bit flexible to prevent it from breaking. It also has a soft foam padding around the lens to improve comfort. Also, like most other goggles, the model has an elastic strap that keeps it properly in place. As far as the lens goes, they are quite resistant. They do a good job at blocking wind and dust and have an anti-fog coating. The glasses themselves can be used on medium to large dogs as well as cats. Petleso dog sunglasses are extremely popular due to their low price tag and build quality. 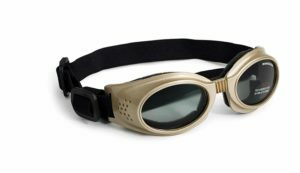 Designed as goggles, the model will always stay on properly as long as the adjustable strap is set properly. For protection, the goggles designed with soft foam padding around the lens. This helps block wind and debris from irritating the dog. The frame is quite durable and will stay on if the strap is properly adjusted. In terms of protection from the sun, the goggles have UV protection coated lens. They are made from polycarbonate to make them shatter resistant and will not get scratched easily. The model can be found in several different lens colors. 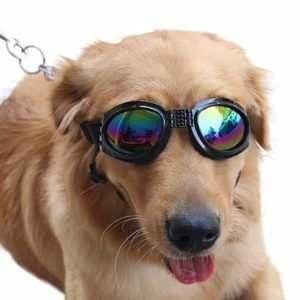 Enjoying dog goggles is a very popular product mainly because it is very inexpensive and well designed. 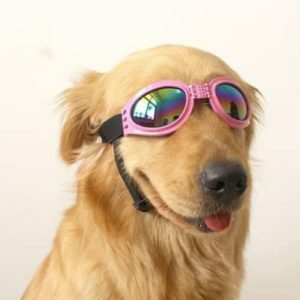 They are made like regular goggles in order to help them stay on properly and provide protection for the dog. Due to their design, the goggles, offer protection on the sides as well. It can block wind and debris. The lens of the goggles has a UV protection coating and is made to be shatter resistant. According to the manufacturers, their goggles can be used for other small pets as well such as cats or rabbits. They have an adjustable elastic strap that ensures a comfortable fit and foam padding on the inside. NACOCO dog sunglasses are probably the most inexpensive product on our list. Regardless, it does not feel cheap or worse in any way when compared to the other models we listed. They are comfortable to wear for the dog and offers great protection against sunlight, wind, and dust. The sunglasses are made mostly for large dog breeds. They are 6.3 inches in length and have an adjustable strap that goes around the head and beneath the jaw. This helps it stay better in place and prevent the dog from taking it off. Even if the lens is not clearly stated as having UV protection coating, they do a fairly good job at blocking sunlight. They are made from a durable polycarbonate material that is shatter resistant and has a dark tint. 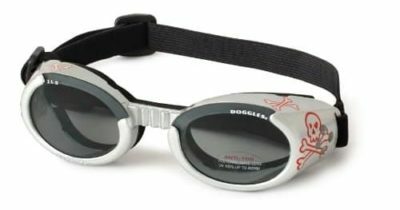 Doggles Originalz dog goggles is a great pick for the ones that are looking for something more premium. It is a bit more expensive but it is a well-made pair of dog sunglasses. Shaped like goggles, the model offers great protection against sunlight, wind and even dust. Because of their shape, the goggles cover the eyes to the sides. They have high durability lens made from polycarbonate which makes them scratch and shatters resistant. Also, they have 100% UV protection coating. The frame of the glasses is made from a flexible material that is very difficult to break. The head strap is adjustable and made from an elastic fabric in order to keep them properly in place. QUMY dog sunglasses are by far the most popular pick amongst dog owners. It is an inexpensive pair of goggles that is functional and offers good protection for our furry companions. 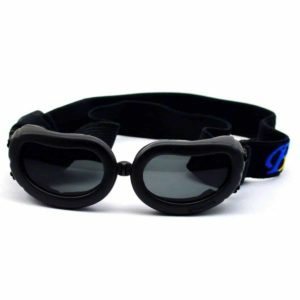 The goggles have a plastic frame that is both flexible and durable. It uses a head and neck strap to keep it properly secured in place. 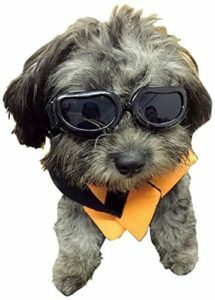 Both can be adjusted so that the goggles will be comfortable for the dog to wear. The lens of the goggles is made from a polycarbonate material and has 100% UV protection coating. Also, the lens has an anti-fog coating and do not get scratched easily. The model is available in several different frame colors. Dog sunglasses are usually designed as goggles and for a good reason. Regular sunglasses will simply not work as they will fall off. Usually, these goggles are quite comfortable to wear due to their design and for the most part they look quite similar when comparing different models. Even if they might seem quite similar, it is important to have a few things in mind to look out for. 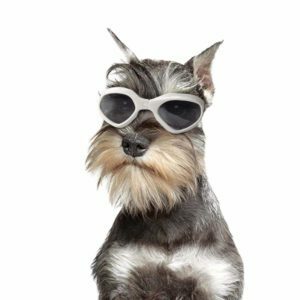 Not all dog sunglasses will fit any kind of dog size and there are several other things that need to be looked at. Sunlight protection. A good pair of dog sunglasses needs to have UV protection. Most pairs of goggles in our list do have such coating in order to properly protect the eyes. Straps. Most goggles usually have a head strap. While that might be enough, the ones that also have a chin strap tend to stay on better. We picked several models that also have a neck strap and some that do not. Padding. Padding can help a lot when it comes to comfort. Usually, manufacturers add some foam padding on the inside of the frame to make them more comfortable to wear. Dog sunglasses may seem unnecessary but that is not entirely true. A hot summer day can affect a dog’s eyes just like it happens to humans. In fact, some breeds are even more sensitive to light than humans. 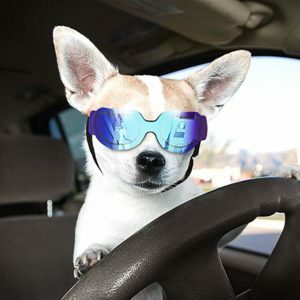 Besides protection from UV light, dog sunglasses also protect their eyes from wind and dust. A good pair of dog sunglasses is usually quite affordable. There are plenty of different models to choose from and all of them are made to be difficult to break and comfortable to wear. The dog might not like them at first but he will get used to them.